but looks different, with small "horns" and a different arrangement of appendages. 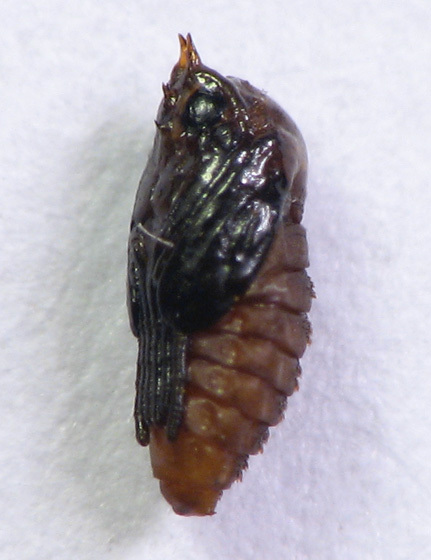 The other type of pupae seems a lot more common. This looks like a gall midge pupa; I'd say the other two are wasps, and possibly two different kinds (maybe just different ages though). I hope you're able to get adults out of all these! I tried to save some pupae, although they are so tiny and hard to handle that they get damaged very easily. I also kept some goldenrod twigs in water, covered by a mesh. I doubt it that I will have any luck. If I wanted to go any further with this I should collect many galls, set up many containers, etc. I wish that other Bugguiders got interested in this. I poke at galls sometimes but can't tell when they're purely fungal problems, or have critters in them - and frankly the fungal ones ick me out, so I don't poke too closely. I also don't see many galls in my part of the city, for some reason - I remember my parents' big back yard when I was a kid had a lot of oak galls and other tree-leaf galls, but don't see them around here. Of course, my search image this summer has been "orange eggs under leaf" and "caterpillar feeding damage" so I may have overlooked galls along the way.